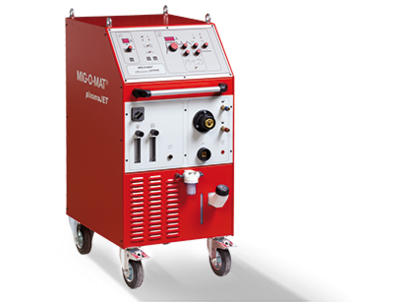 The MIG·O·MAT-appliances plasmaJET 50 and plasmaJET 100 are especially designed for microplasma-arc welding. The unit is equipped with an easy, well-arranged micro control device especially suitable for the requirements of a manual welding process. This control device allows the functions welding in 2-cycles and 4-cycles, plasma spot welding, infinitely variable pre-selection of the main and pilot-arc current as well as a pulse-mode operation with adjustable parameters. The control device is equipped with a digital display of the welding current and the pilot-arc current and is prepared for the utilization of a foot control pedal and plasma spot welding control device. The MIG·O·MAT plasmaJET 100 is dimensioned for a duty cycle of 100 % at 100 amps. Its control system corresponds to the system of the MIG·O·MAT plasmaJET 50. With that the unit provides a wide range of capacity for plasma welding applications and excellent features for microplasma welding.